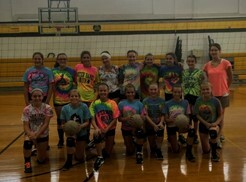 Volleyball at the 7th grade level provides students with a first look into the world of competitive school sports. During this first year of play, we will focus on the basic technique and form necessary for proper passing, setting, hitting, and serving, establishing a solid base skill set to be improved upon in later years. The players will also become familiar several different defensive and offensive rotations. In addition to these volleyball specific items, the players will also learn valuable life skills like determination, teamwork, and perseverance, while also gaining confidence in themselves and learning how to be fit, healthy and strong.